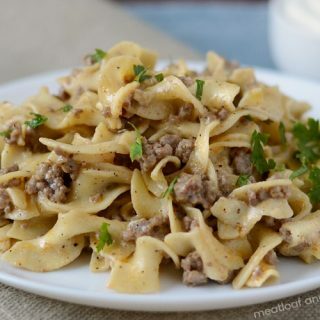 Instant Pot Ground Beef Stroganoff is an easy dinner made with hamburger meat and pasta but without cream soup. It’s budget friendly and kid approved! 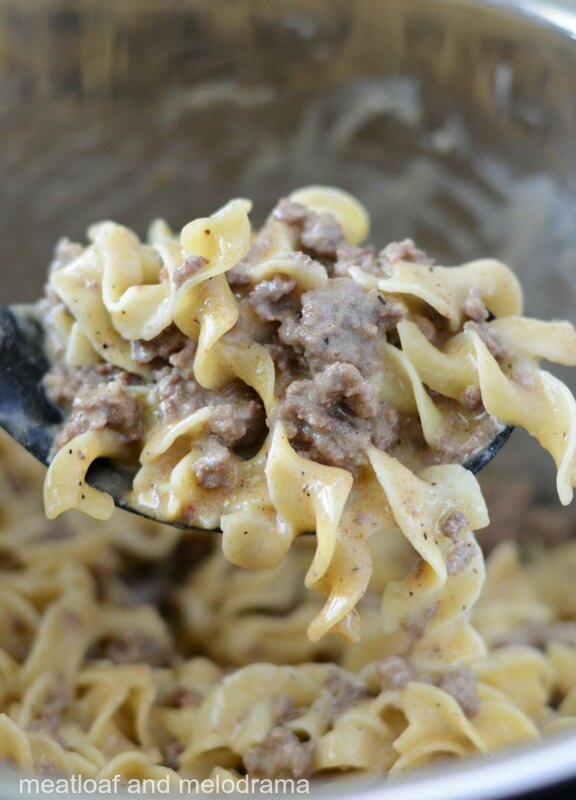 Instant Pot ground beef stroganoff is one of my family’s favorite Instant Pot ground beef recipes — even my picky eater loves it! It’s also one of the easiest Instant Pot recipes you can make. Seriously, you can’t mess this up! Growing up, my grandmother made an authentic beef stroganoff with beef stew meat, mushrooms — the works. And while that was probably the best beef stroganoff recipe I’ve ever tasted, this hamburger stroganoff recipe is so much easier. It’s perfect for busy days! This hamburger stroganoff is made without cream of mushroom soup. In fact, the Hubs can’t have mushrooms, so there are no mushrooms, either. But don’t worry, because there’s plenty of flavor here! Making beef stroganoff in the pressure cooker is super easy. Start off by heating some olive oil in the pot and browning the meat. I use lean ground beef, but if there’s too much grease, drain off as much as you can. Then, season the meat, and add a bag of uncooked egg noodles. Pour in a little Worcestershire sauce and beef broth, and pressure cook it! After pressure cooking, do a gradual quick release to minimize liquid spraying everywhere. Then, stir in a little Dijon mustard and sour cream, and you are ready to eat! 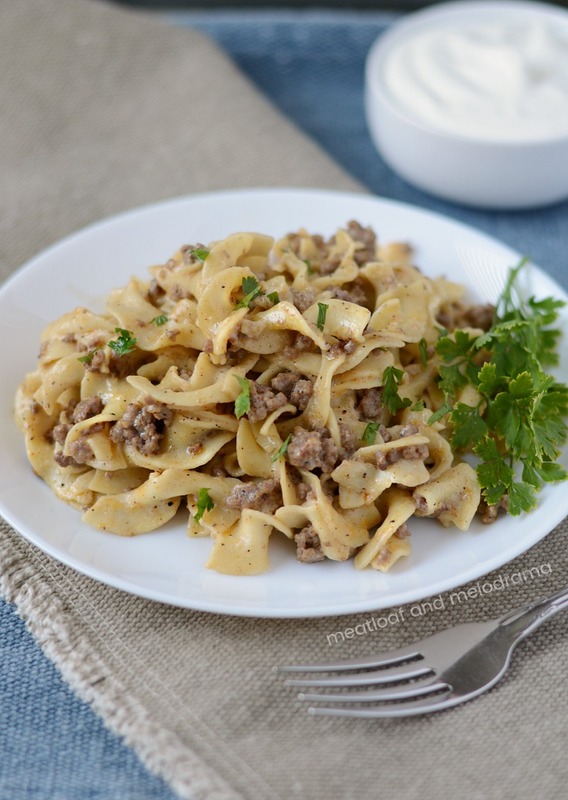 This Instant Pot beef stroganoff is easy, creamy and so delicious! You can add more sour cream if you like, but I usually just put extra on the table and let people add as much as they want. 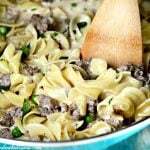 And if you don’t have an Instant Pot, you can make this one pot ground beef stroganoff on your stove! 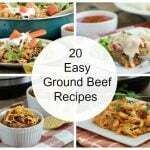 Looking for more Instant Pot ground beef recipes? Hit SAUTE button on the Instant Pot, and when it reads Hot, add olive oil then the ground beef. Break up and stir beef with spatula, and cook until no longer pink. Pot will heat up, then beep when it reaches pressure. After 4 minutes cook time, do a gradual quick release to prevent liquid from spraying. When pin drops, remove lid, and stir noodles and beef. Recipe was made in a 6-quart Instant Pot electric pressure cooker. Can also be made in an 8 quart without changing any ingredient amounts. 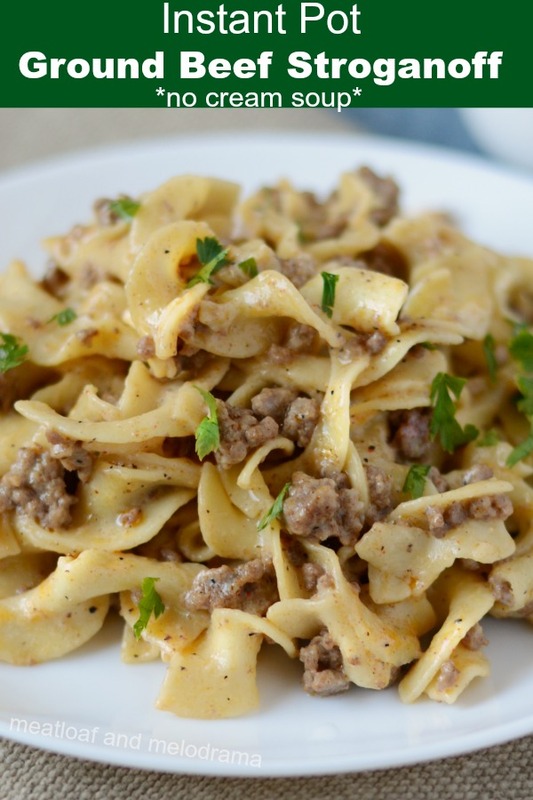 I hope you enjoy this easy Instant Pot Ground Beef Stroganoff as much as we do! Such a great classic, this instant pot version sounds delicious! Thanks, Kimberly. It’s so easy in the Instant Pot! Definitely! I’ll be making this all the time when school starts! Made this the first night the recipe was out. We always have these ingredients in the pantry and ground beef in the freezer. It was great and the kids all loved it. It is a new family favorite for sure! I love all things instant pot. I’ll have to give this a go! Love this recipe! Thank you! Making it for my husband soon! I love this type of easy weeknight dinner! This dinner recipe is a great reason to dust off the Instant Pot. This is the ULTIMATE comfort food. Perfect any night of the week. This looks like pure comfort food! Hope you are having a great week and thanks so much for sharing with us at Full Plate Thursday. I made this two nights ago and it was awesome!! Super simple and fast AND the noodles were perfectly cooked; the flavor was fantastic – oh so much better than making it with cream-o-mushroom soup! Thanks so much for sharing! Dee, trying all of your instant pot dinners. This one was a hit with the family, too! Can’t wait to try more. That’s great news, James. So glad the family liked it! Do you think I could double this in the 6 quart instant pot? It might be a tight fit, but if it doesn’t go over the max fill line, it might work! Another great recipe! It was super easy, and a whole family of picky eaters loved it! The leftovers didn’t even last! Hello, I am very excited to try this recipe, but do you think I can subsitute ground beef with ground turkey? 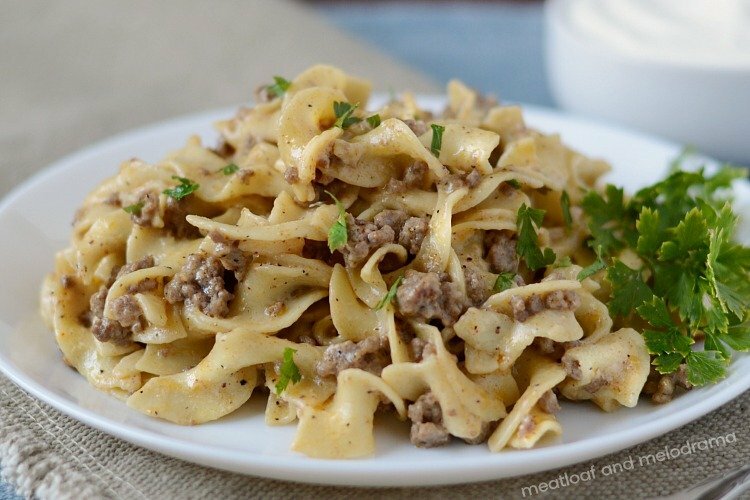 Hello, I made this recipe with ground turkey yesterday, and it came out great! The next time I make it I will add in some mushrooms, but that is all. Thank you for a wonderful recipe! Can I use a substitute for sour cream? My dad is allergic, but I really want to make stroganoff. The sour cream gives Stroganoff a tangy flavor, but you can use a substitute. It just may not taste the same. Well mine turned out like mush. It was the first time I’ve ever used an instant pot. I used an 18oz pack of noodles and I used the 4 cups of beef broth but it was no where near the top of the noodles. So I added more veggie broth and filled it to the top. Well 4 mins it didn’t cook, I did 10 more mins, still not cooked. So I did 20 more mins but it was just mush, the noodles way over done. I think I just put WAY to much liquid in it, still looked full of liquid when I took lid off. 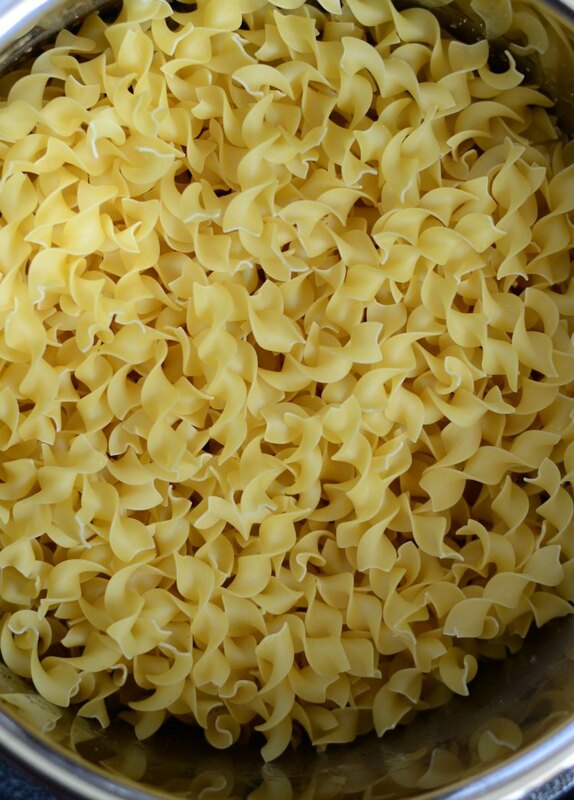 The recipe calls for 12 ounces of egg noodles. Adding more noodles, so much liquid and cooking it that long would definitely make it not work. It probably never came to pressure. Omg! Made this tonite in my instant pot…so easy but more importantly it was beyond delicious! Thank you for sharing this awesome recipe! !! I feel silly asking but, what exactly is a gradual Quick release and how do I do that?? I’ve recently pulled my Instant Pot out and I love love love your site!! !